Students in Columbia’s Networking and Information Technology classes learned about potential cyber careers in the FBI last week when they heard from two guest speakers. 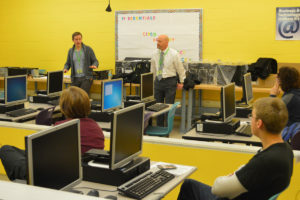 FBI outreach specialist Timothy Leonard and cyber security agent Roderick Link, both from the Albany field office, talked about the mission of the FBI, how they use technology to prevent and solve crimes and the various FBI careers involving cyber skills. The classes are planning to tour the FBI’s Albany field office after the holidays.